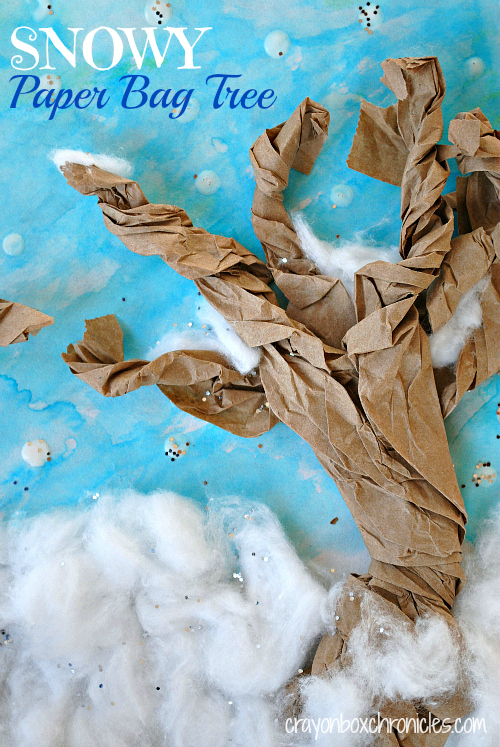 Welcome to Winter Books, A Craft and Activities Series. 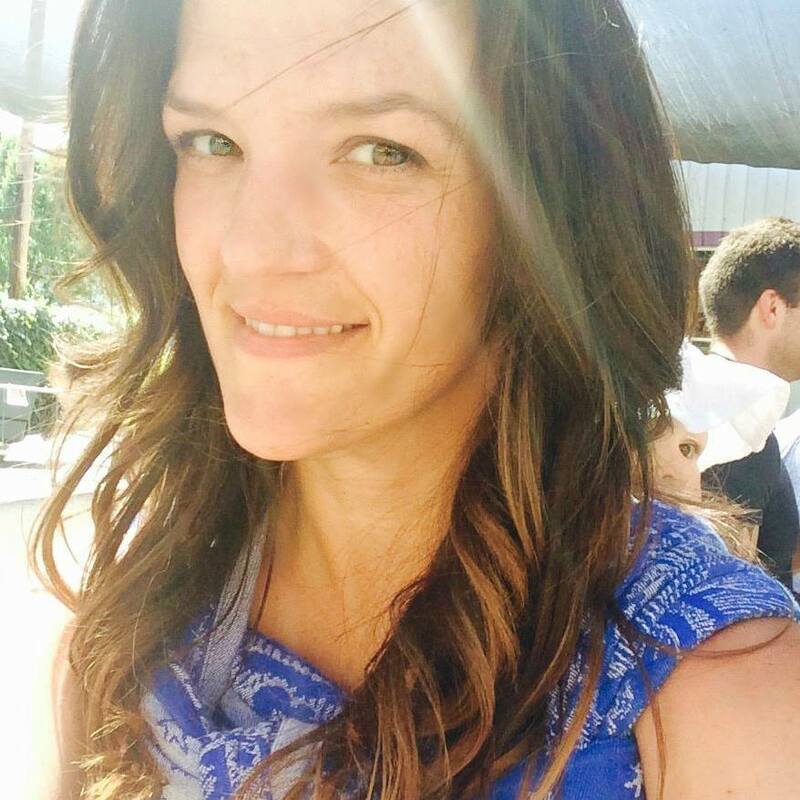 I am so exciting to be working with the super-talented All Things Kids Moms to bring you winter books and related activities. 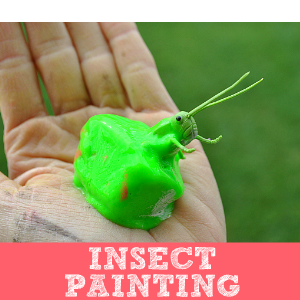 Frogs Snails & Puppy Dog Tails, Sugar Aunts, Fun-A-Day, All Done Monkey, House of Burke, and Mammas Like Me and myself are collaborating the first Monday of each month to bring you a new series. 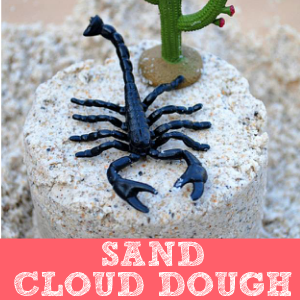 For even more fun and educational activities, check out All Things Kids Pinterest Board. Winter is such a fun time of year! 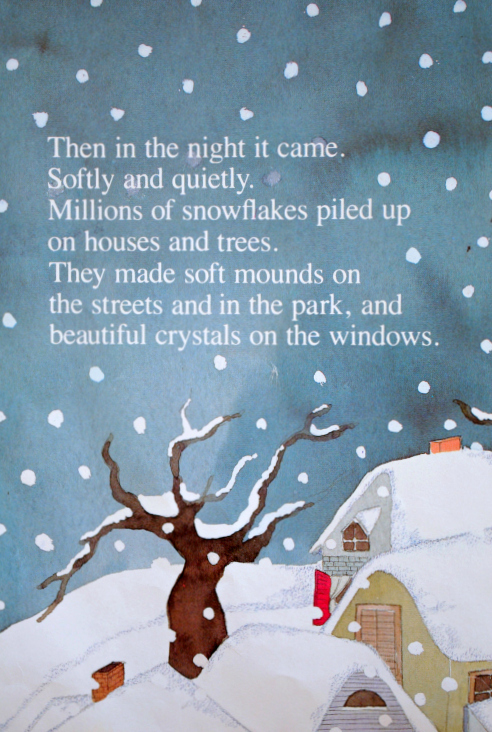 There’s so many wonderful books to choose from about playing in the snow and making snowmen and snow angels. 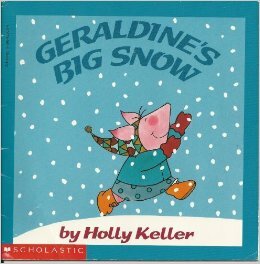 We chose Geraldine’s Big Snow by Holly Keller for our winter book. Have you had a chance to read it? 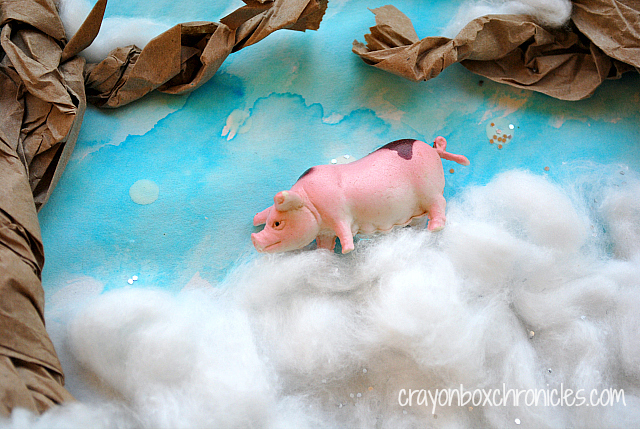 Geraldine’s Big Snow is about an energetic little piggy who is impatiently waiting for the BIG storm! She has a new sled and she can’t wait to glide down the soft and fluffy snow! She waits, and waits, and waits, but sadly, no snow. As she ventures outside, she meets a few characters along the way! Will the BIG storm ever come? 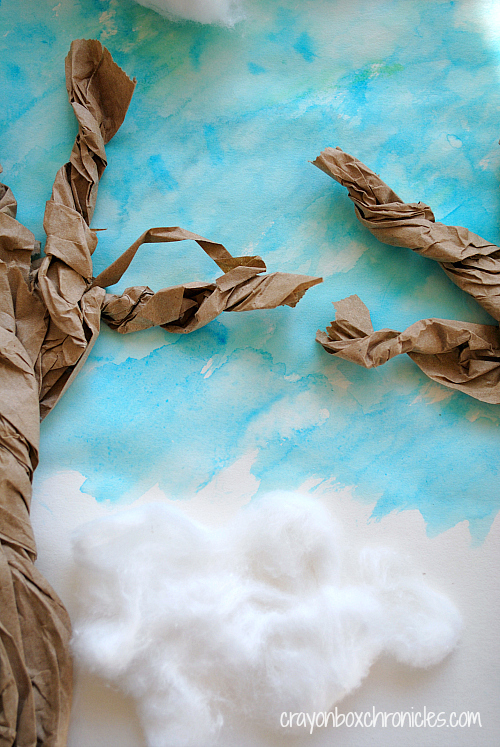 Our craft was inspired by these beautiful trees covered in snow after the BIG storm! 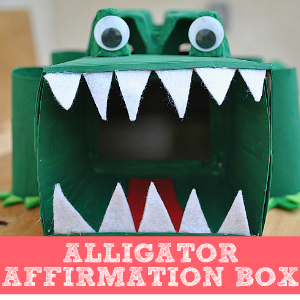 This fun craft is easy to set up and uses basic crafting materials you probably have lying around your craft table. First, let’s prepare our canvas and paint the sky! 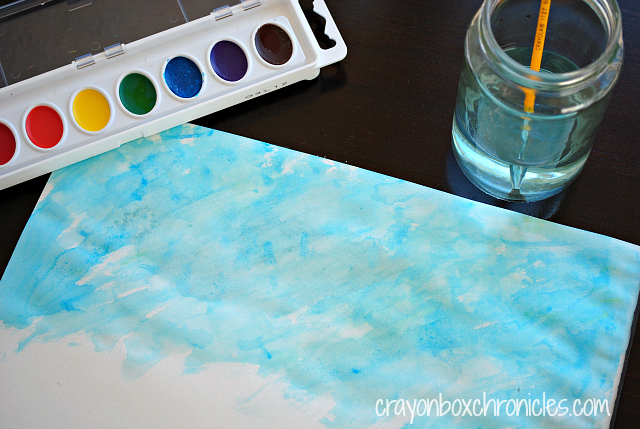 Watercolors are so beautiful. I never really gave them much attention, but after todays craft, we’ll be using them often. Simply, dip and paint. 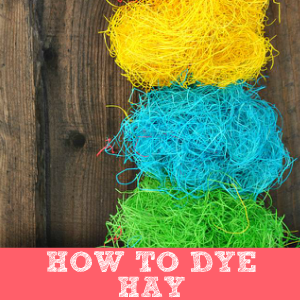 We used blue, green, and a little black. Next, let’s prepare the trees. 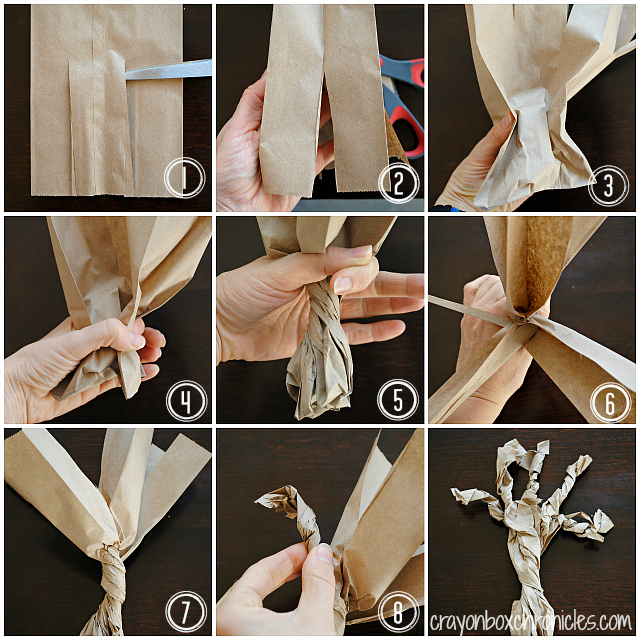 Here’s a step-by-step guide to making the braided paper bag trees. Using a standard size lunch paper bag, cut 2-3 slits half way down the bag. Open the bag up and cut a slit down the side seam of the bag, half way. Leaving the bag open, scrunch the bottom of the bag. Squeeze tightly and begin to twist the bag. Twist half way up the bag until you reach the slits. This is the top view after your base is done. Fan out the untwisted “branches” of the bag. Holding the base of the branch slits, begin twisting them tightly. Be sure to pinch the base of the slit or they can rip off. Once all your branches are twisted, you can manipulate the branches and trunk to go in any direction. 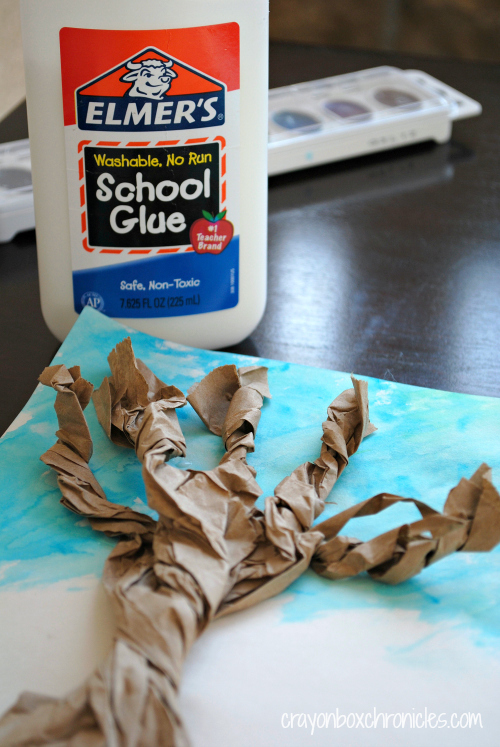 Next, add glue, lots of glue to the base. Tip: Pinch or flatten the areas you’d like to glue down. I really squeezed the brown bag flat in a few spots to give the trunk and branches a few flat spots. Also, I didn’t glue everything down, just the base and a few spots of the branches. Hold it down for 2-3 minutes or use a heavy book. Here’s a close-up of the branches, fun right?! I love how realistic they look coming off the paper. 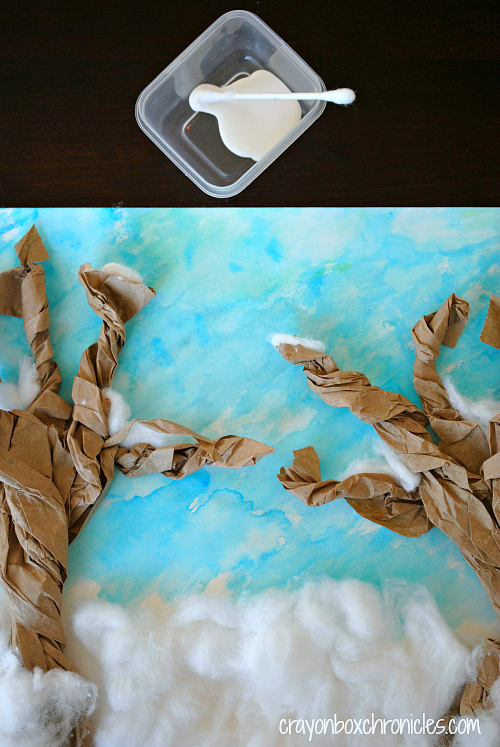 Next, let’s add the “snow!” Simply, pull apart cotton balls and glue them down. This was a BIG storm, so lots of snow was in order! Geraldine was so excited when the BIG storm finally hit during the night! It’s falling snow time! 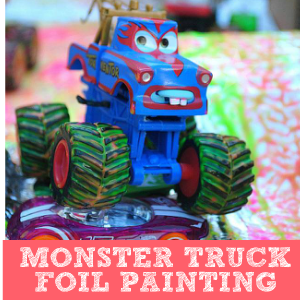 This painting technique is so fun! 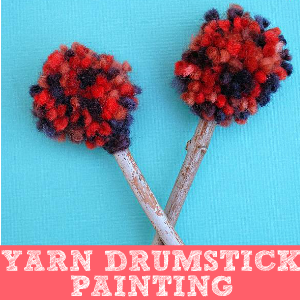 Q-tips as a paintbrush – neat! 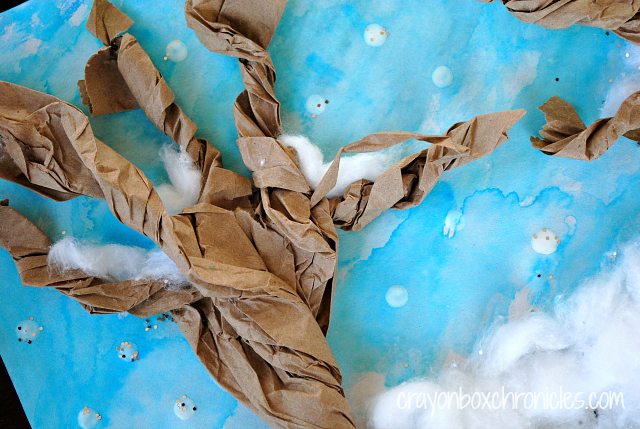 Just dip and dot the paper to create falling snow! Lastly, add your heavy, accumulated snow to a few branches. It was a BIG storm last night and the snow is still falling. I dashed a little silver glitter for fun. Geraldine coasted down the big snowy hill! She lost her sled along the way! 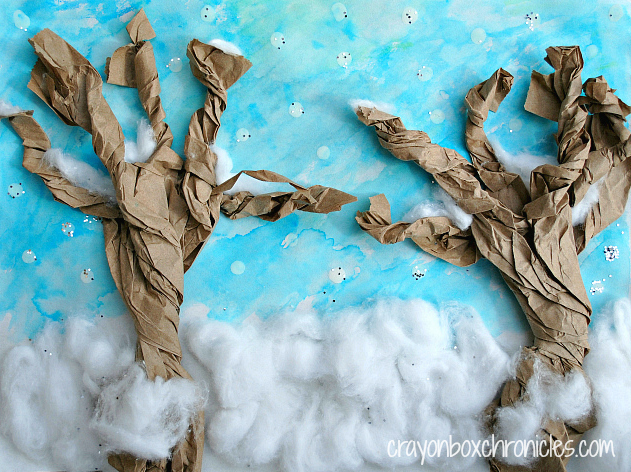 Here’s our snowy paper bag trees on a stormy winter day! 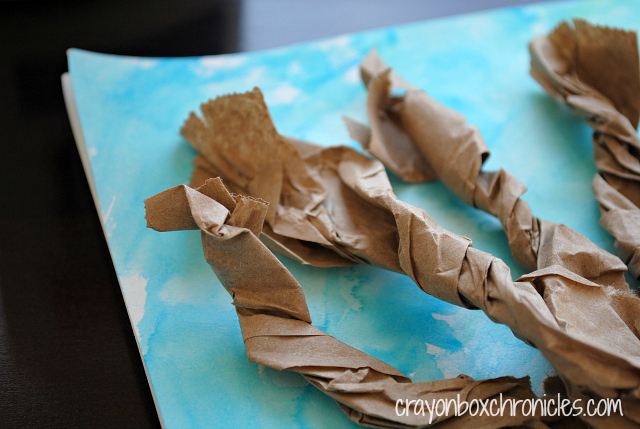 I hope you enjoyed our winter craft and book. 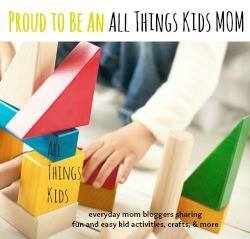 Join us the first Monday of each month for a new collaborative series with All Things Kids Moms. 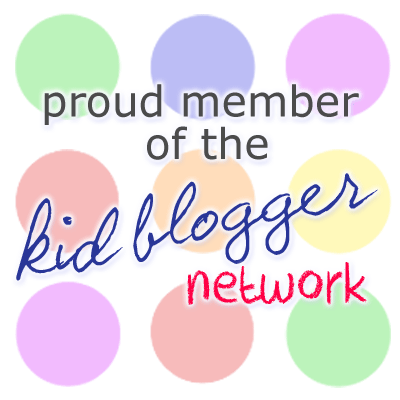 In the meantime, link up below and check out the amazing activities that the ATK bloggers are sharing [links below]. I’ll update as they share their activities. We’d love to see your related winter book posts! Be sure to LINK UP below! Just click the cute blue monster! 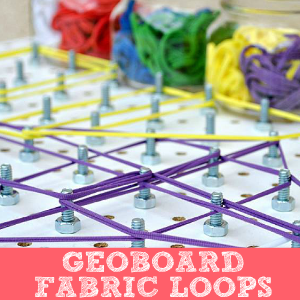 I really love this craft – it turned out so beautifully! Thanks for participating in the Winter Books series! thank you Leanna! It was a lot of fun! Can’t wait for this months series. Love the tree, it looks great. I love collage and painting art. These turned out really well. Hi Rachel. Thank you! It was a lot of fun! 🙂 Have a great weekend. Not only do I love how you have made the tree but just how much it looks like the one in the book. Pingback: DIY Snowman Kit - Book Inspired Family Fun - Fun-A-Day!